Saturn’s largest moon Titan has a thick nitrogen atmosphere – unique among all the moons in the solar system. A new study suggests Titan’s atmosphere originated from organics being “cooked” in its interior. 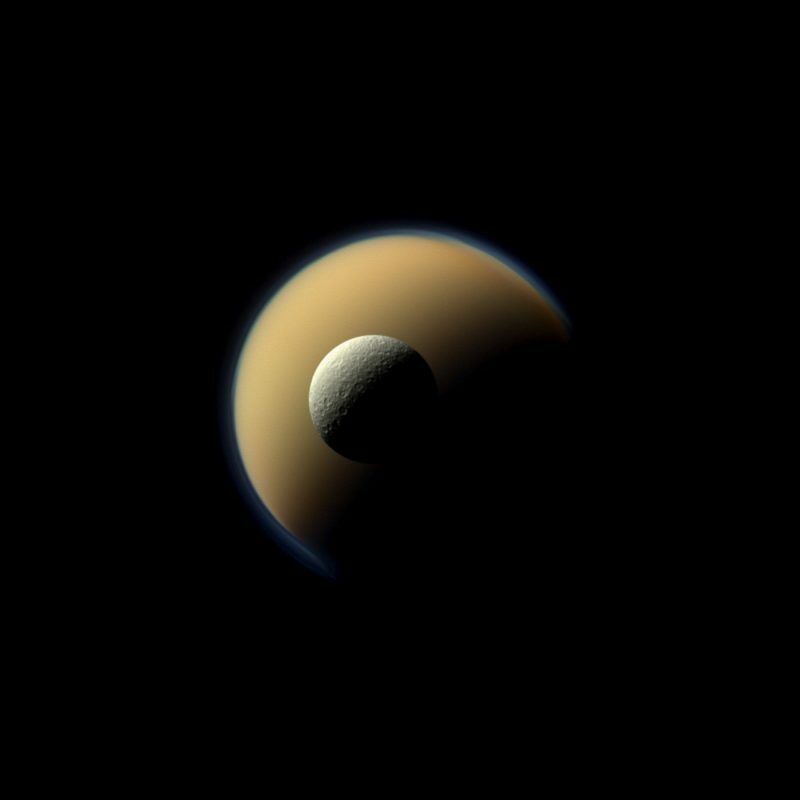 Saturn’s large moon Titan, with its smaller moon Mimas in the foreground, as seen by the Cassini spacecraft in 2013. Titan’s atmosphere is thick and hazy, and mostly nitrogen, like Earth’s. Where did the nitrogen come from? Image via NASA/JPL-Caltech/Space Science Institute. Titan is Saturn’s largest moon and, in many ways, seems more like a planet than a moon. It is eerily Earth-like, yet a very different world from Earth, with extreme cold and rivers, lakes and seas of liquid methane/ethane. Also, Titan is the only moon in the solar system that has a thick atmosphere, and, in that way, too, it’s reminiscent of the major planets in our solar system. Titan’s atmosphere is composed primarily of nitrogen, like Earth’s. Just how Titan’s atmosphere developed has been one of the long-standing mysteries of this bizarre world. Titan is a very interesting moon because it has this very thick atmosphere, which makes it unique among moons in our solar system. It is also the only body in the solar system, other than Earth, that has large quantities of liquid on the surface. Titan, however, has liquid hydrocarbons instead of water. A lot of organic chemistry is no doubt happening on Titan, so it’s an undeniable source of curiosity. The main theory about Titan’s atmosphere has been that ammonia ice from comets was converted, by impacts or photochemistry, into nitrogen to form Titan’s atmosphere. 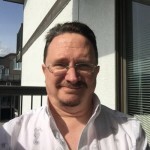 While that may still be an important process, it neglects the effects of what we now know is a very substantial portion of comets: complex organic material. Artist’s concept of the Huygens probe descending through Titan’s thick atmosphere before landing, in 2005. Image via NASA. Comets and primitive bodies in the outer solar system are really interesting because they’re thought to be leftover building blocks of the solar system. Those small bodies could be incorporated into larger bodies, like Titan, and the dense, organic-rich rocky material could be found in its core. 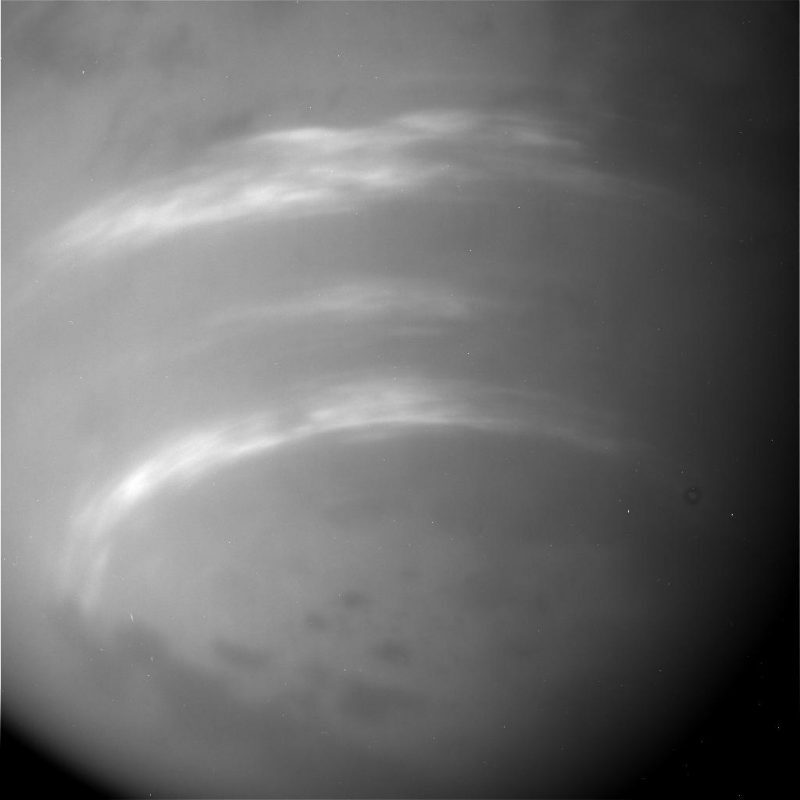 Titan as seen by Cassini’s radar, showing methane clouds in the atmosphere. Image via NASA/JPL-Caltech. How exactly does all this apply to Titan? Miller compared thermal models of Titan’s interior to data from organic material in meteorites. The idea was to see how much gaseous material could be produced from meteorite impacts into Titan when it was first forming. The result was that about half of the moon’s nitrogen and perhaps also most of its methane could be accounted for in this scenario. The organics would be “cooked” into Titan as it was forming a few billion years ago. While primarily nitrogen, Titan’s atmosphere also contains about 5 percent methane, which can form organic compounds. Those organics are all over Titan today – both in the atmosphere (as haze) and coating the surface (including massive “dunes” of organic material). 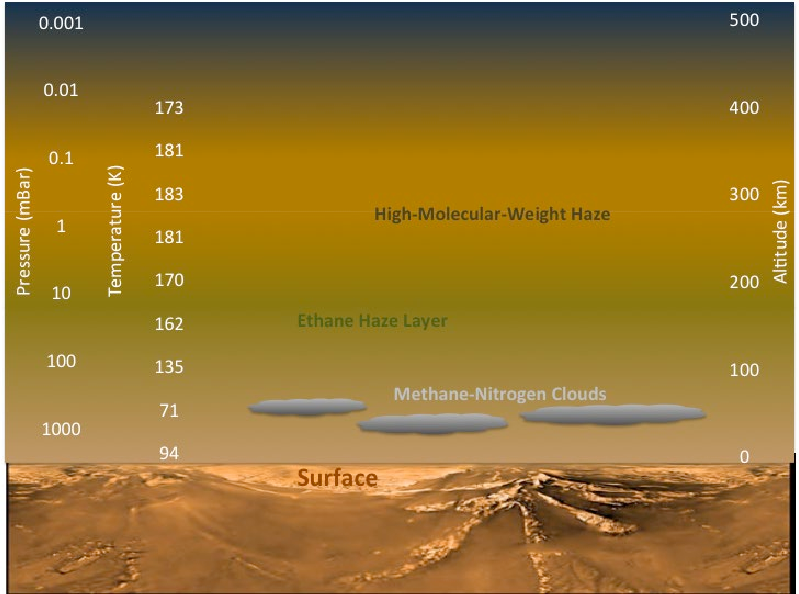 Structure of Titan’s atmosphere, which is composed primarily of nitrogen and methane. Image via Anthony J. Colozza. But Titan’s atmospheric methane supply still needs to be replenished somehow since the gas breaks down over time, and scientists are still not sure how that happens. On Earth, most methane comes from biology, but on Titan – given the extreme conditions – it is more likely to be primordial methane left over from when the moon first formed, similar to that found in the atmospheres of the ice giants Uranus and Neptune. Some scientists, however, do think that primitive life of some kind is possible on Titan, perhaps in its methane/ethane lakes and seas or in the subsurface water ocean. Bottom line: Titan’s thick nitrogen atmosphere is unique among moons in the solar system. The nitrogen may have been “cooked” inside Titan.